In a few weeks it will be exactly a year since I redesigned this site. It really has become an annual event. This time I’ve redesigned it but also rebranded and added new features. I really liked the domain bradt.ca. I mean come on, firstname.lastname.com is pretty sweet. That is unless your last name is hard to say, spell, and remember. Mine is. This was my motivation for rebranding. I bought the domain name capeislander.com with the intention of identifying with my roots and creating a theme based on Cape Breton, Nova Scotia, where I grew up. 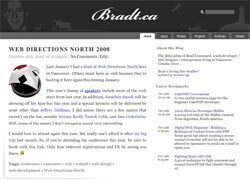 Later I realized that bradt.ca was available and a much better choice. In fact, I’m already the fifth site if you search “bradt” on Google! For this design I had the same design goals as I did a year ago. This time however, I wanted to make sure the design looked good in Safari. Easily allows you to integrate a Flickr gallery into your theme. Gets your Last.fm recently listened tracks. Allows you to output your Ma.gnolia bookmarks. Retrieves your recent Facebook status’. Because each of these plugins accesses third party content, it can be slow to load a page which employs a plugin. It can be even slower if the page employs several of the plugins. And even slower again if one of the services is experiencing a high volume of requests. To tackle this, I wrapped each plugin in a “module” that could be loaded after the page has loaded via Ajax. Gives you a preview of your comment as you type it. Generates related posts via WordPress tags. Most of these plugins worked exactly how I wanted out-of-the-box, but I did have to tweak a couple. I added a nice feature to the Live Comment Preview plugin which gets the user’s Gravatar if one exists for their e-mail address. The StatusPress plugin also required some tweaking so it would only show the latest status. I’m not at all happy how StatusPress works actually and I’m thinking of writing a proper Facebook/Twitter status plugin in the future. Try out the comment preview feature (it’s fun, especially if you have a Gravatar) and let me know what you think of the changes.